Last weekend brought the end of Daylight Saving Time. While I do appreciate the extra hour of sleep, and this transition is certainly easier than its counterpart in the spring, I lament for the lost hour of evening daylight. Since I work a separate full-time job outside of photography, a fair amount of my shooting time comes from the last hour or two of sunlight before dusk. However, for the past week, I've been watching the sun set in the last few minutes before I leave the office (some of which have been quite spectacular). From a photographer's perspective, this is quite depressing. No more photography on weekdays! Now, if I want to shoot at all during a given week, I have to set time aside during the weekend. However, my weekend schedule doesn't always have that kind of flexibility! So, what do I do? Get up at 5:00 am. You see, the thing about DST ending is that we don't actually lose an hour of light; that hour just gets shifted to the morning. So, this morning, I got up an extra hour and a half early, and headed out to a nearby trail. As I walked down the trail, I was fairly skeptical that I would actually get any photos. The cloud cover was thicker than I had anticipated, and it was starting to look like I wouldn't even get a hint of a sunrise. Ultimately, I found that I didn't really care. With fresh air in my lungs and seemingly the whole world to myself, I was just happy to be out in nature. It always surprises me how good it can feel to get up early. Maybe not right as you are climbing out of bed, but there is something special about enjoying nature when the rest of the world is asleep. I could have left an hour later with an empty memory card and still had no regrets. Fortunately, it didn't come to that. 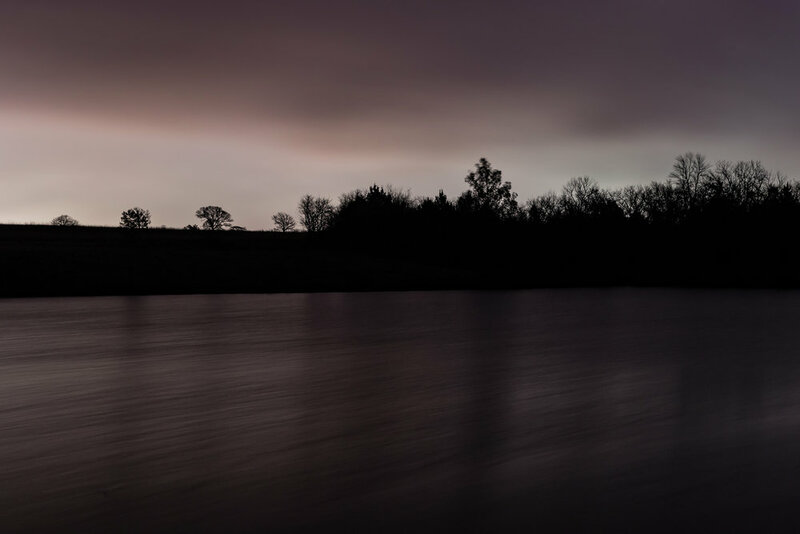 As I approached the small fishing pond I was going to shoot at, a sliver of the moon shone through the clouds, and my excitement spiked. I quickly set up my tripod, got out my camera, and set it up to take some long exposures. At first, the clouds covered the moon again, and I could only draw the smallest bit of light out of the scenery. Then, a few minutes later, the thicker clouds gave way and I was able to capture some wonderful colors in the sky that reflected beautifully in the water. I tried a few different compositions, and a few different shutter speeds, and got some decent results (especially once I later brought them into Lightroom). The problem that I ran into was wind. Even if I kept my camera/tripod steady, the wind was blowing around all of the vegetation too much for me to get a sufficiently sharp image for my tastes. Some creative editing certainly helps, but getting sharpness right in-camera is always far better. Were it a weekend, I would have tried to wait a little longer for the wind to die down at least long enough for me to get an exposure or two, but time was sadly not on my side. 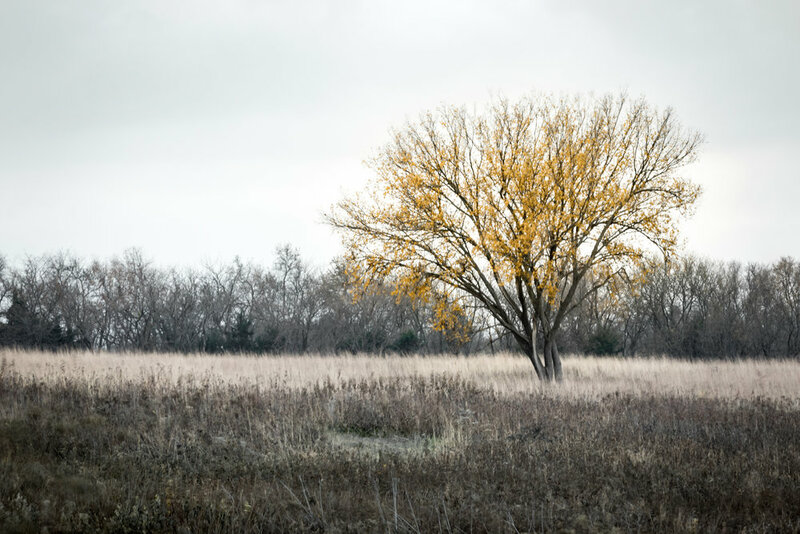 However, just as I was packing my gear back into my car, I turned around and saw one, lone tree in the middle of a field behind me, and it happened to still have its fall color. I checked my watch, saw that I had just enough time to snap a quick picture or two without making myself late, and pulled my gear back out. I'm glad I did, because the resulting photo is probably my favorite of the morning. It is still not perfect due to the same pesky wind I encountered earlier, but even without being tack sharp or well lit, I love how the tree provides a bright burst of color in an otherwise drab grey-brown field. I will be the first to admit that none of these photos are my best work, but I still am incredibly happy to have gone out this morning. My outing proved that I still have a window of time to go out and shoot throughout the week. All it takes is a little planning ahead and the self-discipline to get up a little bit earlier than normal in the morning.